Zunashi the Exile is located in a cave underneath the large dinosaur skull in The Bone Pit, just north of Atul'aman. He drops Ravasaur Skull Bijou. There is also an associated world quest Zunashi the Exile. Zunashi the Exile rare is located in Vol'dun in The Bone Pit subzone on Zandalar isle. He is inside a small underground cave. Cave entrance is in the head of the huge dinosaur fossil, north of the rare mark. This NPC is found inside an underground cave. To get to the cave entrance, fly to the Goldtusk Inn in Vol'dun, and then mount up and get to 43.9, 52.0. 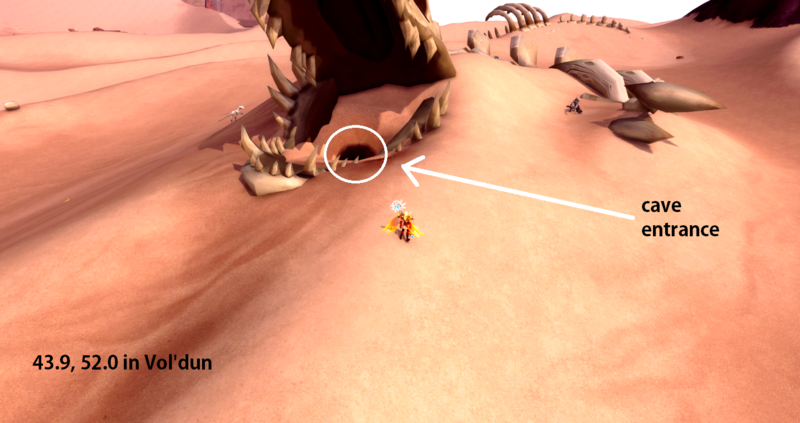 If you face south then you will see a big skull with its mouth open, and inside the mandible of the skull you will find the cave entrance, which leads downward into the ground. I have included a screenshot here of me standing at 43.9, 52.0 in Vol'dun and facing south toward the skull and cave entrance.